Well, I’ve been promising all of you a blog post here since January, and thus far, I’ve failed. So, I suppose I should start with my long-time love: baking. I bake a lot. Those of you who know me know it’s something I do on probably a weekly basis. I make everything from savoury to sweet and (almost) everything in between. I love cooking, too, but that’s a little harder to do on a big scale. Baking is great: it’s the middle ground between cooking for 10+ people and making yourself exhausted and actually getting to get the satisfaction of providing food for other people: something that, I’m relatively sure, is one of human nature’s greatest feelings. 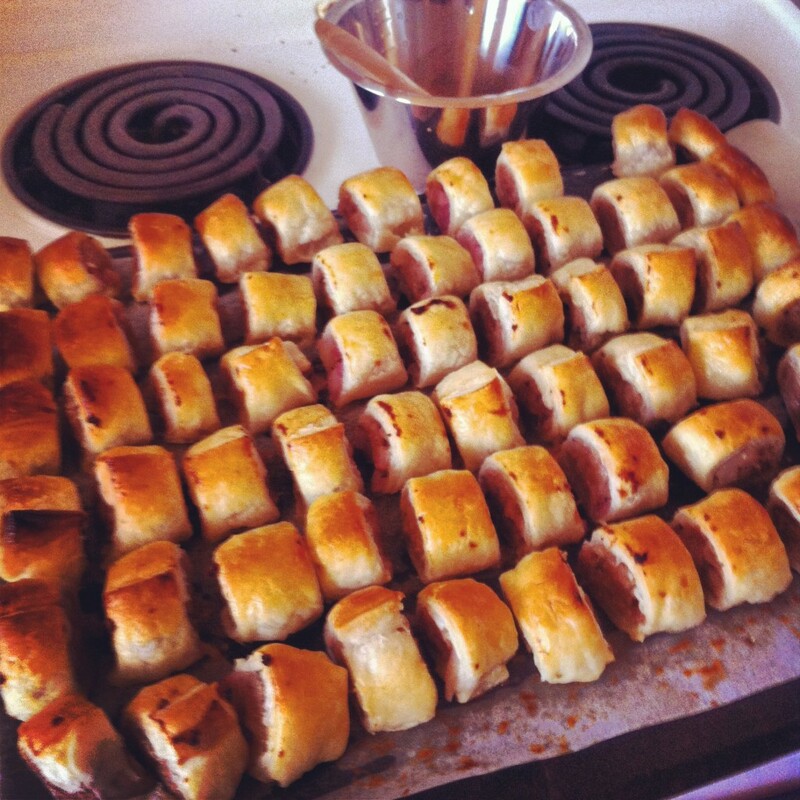 Every time I make sausage rolls for people, I get many, many questions asked of me. “What are those?” “Did you make them?” “They look bizarre, but they smell so good!” “What’s that thing you’re putting on top?” “SERIOUSLY, DID YOU MAKE THOSE?” “I’m so hungry now”, etc et al. Homemade sausage rolls are one of my favourite things to make. They’re SUPER easy and really really bad for you – and, truth be told – I’ve really just stolen a recipe from Jamie Oliver. It’s not a secret recipe at all. But it is a recipe that a lot of people are baffled by when I tell them I’ve made it myself. But, all that said: here’s the way I make mine. Prep time: 20min (minus the homemade filo pastry – but you can cheat and buy premade stuff). FIRST! Pre-heat the oven to 180 degrees. Melt the butter in a small pan, and chuck the red onion in, along with the sage & the nutmeg. A sprinkling of each will do! When the red onion is soft, place it into a bowl and let it cool. Take the sausages out of the casing (so you have the sausage meat), and place them into the bowl along with the red onion. Mix the red onion + the sausage meat with your hands, adding breadcrumbs in until the mixture isn’t too greasy. Separate out the filo pastry into small balls, and roll it out into long, thin rectangles. They pastry should be about the thickness of a pound coin. Make sure there’s no holes in the pastry, as this will make rolling the sausage rolls difficult. Place some of the sausage meat into the centre of the pastry rectangles, and then roll the pastry so it’s in a roll shape. Cut the rolls up into smaller rolls (or as big as you’d like it to be in order to eat it! ), and glaze the top with the egg & milk mix. Place them onto a pan, chuck them into the oven for 20-25 minutes. BAM. Done. Serve with tomato sauce. Next time, on the baking… the infamous Tardis Cookies – the gluten free taste sensation.